Italian Esploratore laid down 1931 Laid down 1st April, 1931. Launched 19th August 31. Completed 18th March 1932. Basically identical to the 1939 and 1937 Class destroyers. 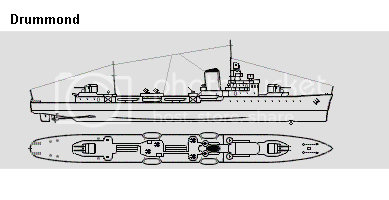 Rebuilt ex-Brazilian Margay Class destroyers purchased in Q2/42. Class Names: Murature, Rioja, Jujuy, Hercules, Heroina, +?